Wanna keep track of how many of a product or option you’ve sold, and have those sales deduct from the available quantity? Put away your spreadsheets and Post-it Notes, ‘cause this feature lets you do just that. With inventory tracking enabled, and overselling disabled, any item in your shop that reaches a quantity of zero will display as Sold Out automatically. This way you won’t accidentally sell more than what’s available. When viewing products in the admin, in the inventory view on the Products page and on your Dashboard, you’ll see a couple color indicators: red means sold out, yellow means your available stock is below 25%. What’s Allow product overselling, you may wonder? 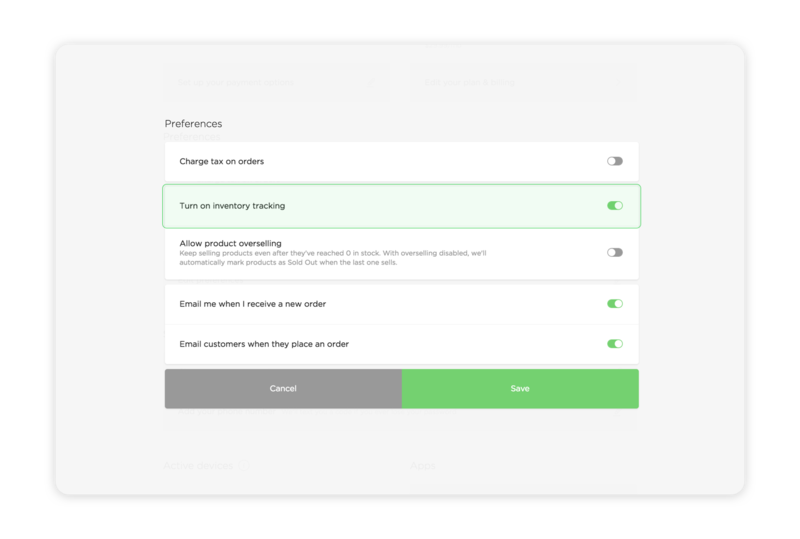 This setting, which is located just below the inventory tracking setting, would allow you to sell more of a product than what’s in stock - even after the quantity hits zero. Stores with limited quantities available to sell, however, should leave this option turned off. Toggle on Turn on inventory tracking. Click the Products icon at the top. Now when you add or edit a product listing, you can enter the number of products/options available in stock within the Qty fields. Launch the Big Cartel app.